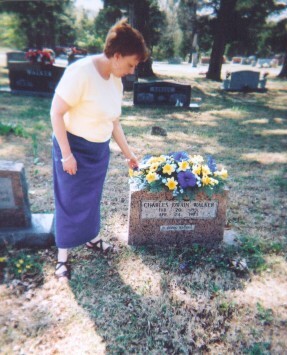 Myrna spends a moment alone at the grave of her father in Arkansas. In the last few days, zinnia seeds have begun to poke through the ground that were planted along the sidewalk in front of our home as well as the rock wall. Every year when these beautiful flowers are in full bloom, I receive lots of comments about how pretty these flowers are, but I’m quick to give credit where credit is due. I’m not the one who does all the hard work to make this possible. It’s my husband who does that job. He’s the zinnia grower at our house. And this entry in my journal will tell the story of how a seed was once planted in the mind of a young mother following a comment her grandmother made about her newborn daughter. Twenty-five years ago, Myrna Holman and husband, Johnny Holman, became the parents of a little girl they named Laura. The first time Myrna’s grandmother, Mae Colson, saw Laura, her great-grandchild, she made the comment to Myrna that Laura looked just like Myrna’s father. And it was that comment that started Myrna seriously thinking about the possibility of finding her father. Up until that time, all she had was a name, Charles Walker, a fellow who had lived in Illinois. Someone reading this story might question why she waited so long to begin her search, but Myrna’s answer is a simple one: she grew up with as much love as there could possibly be for any little girl, so she really didn’t ask any questions about her father when she was small, nor did she believe anything was missing from her life. But that comment from her grandmother Colson started her thinking. If her own daughter looked like her father, did she (Myrna) resemble him any at all? And what about medical information she might need to know sometime? Thus, in 1978, her search began, which she started by asking her grandfather, Hershel Colson, what he knew about her father. A last known address of Beaumont, TX, was about all that was known, and it was with this little tidbit of information that she began a long and drawn-out process. The names of her father’s parents, Basil Walker and Ola Walker, were the next bit of information she was able to find out. After many years of not getting anywhere, and as time went along, computers that contain unlimited information were made more and more available to most everyone. Armed with only those two things to go on, Myrna went online. She was overwhelmed with the hundreds of Charles Walkers listed in the computer, and had no idea how to go about narrowing down the number. Her next step was through e-mail to try to find vital records in the state of Illinois, where her father was born. This resulted in running into another stumbling block when she was told the state of Illinois is a closed state as far as information from birth records is concerned. But some important information she was given by a very friendly and helpful clerk was a website that might possibly be of some help to her. The clerk referred her to www.ancestry.com, and after logging on to that site, she was directed to go into the Social Security index, under the family tree section, and to type in what information she had. In the next few minutes, much to Myrna’s surprise, there appeared on the screen her father’s name, his date of birth, and the names of his parents. But it also contained information Myrna had not counted on. His date of death was also listed. The name of the person who had provided this information was also on the screen, along with an e-mail address, and that person turned out to be a relative of her father. At this point, Myrna was not sure about contacting that relative, someone who didn’t know she existed. She hesitated to go further, but decided that since she had come this far, she would go on with the search. The person she contacted was her father’s first cousin, Michael Walker, who lived in Springhill, KS. After communicating first by e-mail, Myrna then talked to Michael on the phone. 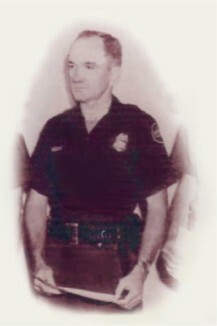 Information about the family was exchanged between the two, things such as Myrna’s father had been married to a woman from the state of Louisiana, and they had two daughters whose names were Mary Ann and Sherry Ann, and at the time of his death, he was employed as a Texas border patrolman. He died in an automobile accident in 1973. She also found out that her half-sister, Mary Ann, had died when she was only 25 years-old. After taking in all this information, Myrna and Johnny then planned a trip to Arkansas to meet Michael and other family members at the home of Michael’s mother, Marie Walker. On March 29 of this year, Myrna and Johnny left for Arkansas. Myrna described the feeling she had as they got close to their destination as one of being scared to death. But it turned out much better than she expected; the members of the Walker family welcomed her with opened arms. There were tears shed as well as hugs shared. A visit to the cemetery where her father and her Walker grandparents were buried was included in the trip. 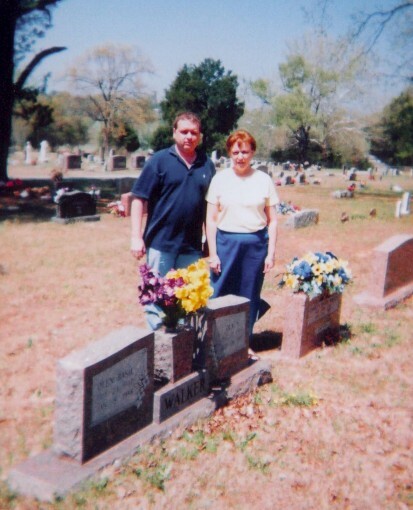 Myrna placed memorial flowers on the graves of each family member before she and Johnny ended their visit. Myrna cherishes a photograph of her father, Charles Walker, which was taken the day he completed his training and became certified a Texas border patrolman. While on this visit, she was also able to speak by telephone to one of her grandfather Walker’s sisters, the only one of that branch of the family still living. Basil Walker died in 1988 and Ola Walker died in 1991. One of the things that troubles Myrna about not being able to know her father or her Grandpa and Grandma Walker is that for 11 years, she and Johnny lived in Arkansas, only three hours from the town of Batesville, the place where her grandparents lived. She also remembers – and doesn’t really know why she remembers this – when she and Johnny moved to Arkansas in 1976, her grandmother Colson made the comment to her that she had relatives there. She again, didn’t ask questions, but that comment stayed in the back of her mind. Myrna’s cousin, Michael Walker, took her to the cemetery where her grandparents and father were buried. She placed flowers on each of their gravestones. As of the date of the writing of this entry in my journal, Myrna has not made contact with her half-sister, Sherry, who lives in Maurice, LA. Sherry, who learned about Myrna through Michael Walker's brother, Johnny, has told Michael she’s really glad to know she has a sister. Myrna plans to contact her soon. It was only after the birth of her own daughter that Myrna began to give serious thoughts about finding her father. Up until then, she had never considered it necessary to know anymore than she did. Had it not been for Mae Colson’s thoughts she expressed when she saw her new great-granddaughter for the first time, who can say whether Myrna would know today what she does about her family? The seeds that were planted so many years ago through words that were spoken by her grandmother brought her to this point in her life, and although she never had the opportunity to get to know her father or the grandparents on that side of her family, she is happy with the results that came about, and has hopes of establishing a close relationship with her half-sister. Hopefully, she can share the rest of her story as it continues to develop in the days to come.